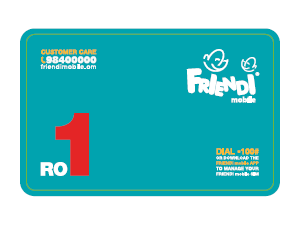 FRiENDi mobile has introduced a new RO 1 recharge card. Muscat: January 01, 2012 – FRiENDi mobile, the Sultanate's 3rd biggest mobile service provider has introduced a new 1 Rial recharge card.  As a launch offer, on every recharge of the 1 Rial recharge card, customers get 20 free SMS. The limited time offer is valid until 25th Feb 2012. The new 1 Rial recharge card has been redesigned in size and it is now more convenient for customers. With FRiENDi mobile’s low internet, calling and SMS prices, one 1 Rial recharge card lasts for a long time. FRiENDi mobile welcome packs and starter kits are available across Oman, notably at all the Lulu Hypermarkets, Zahra Phones, Zahrath Al Hanna, and FRiENDi mobile outlets in City Centres and Muscat International Airport. Since its launch, FRiENDi mobile has been offering great value to its customers and its success is a result of its full range of mobile services like low call rates, excellent call quality, fantastic network coverage, and friendly six-language customer service staff. FRiENDi mobile has introduced many features that are completely new to Oman, such as recharging directly from www.friendimobile.om or having recharge cards available at every Carrefour cash counter. FRiENDi mobile is an international telecommunications group, headquartered in UAE, with a presence in Oman, Jordan, and Saudi Arabia, with more countries opening soon.